Officers: Squire: Del ‘The Hat’ Darlison, Deputy Squire: Chris ‘The Beard’ Thorp, Bagman: Chris ‘The Post’ Dudman . Dancers and Men: Bill , Chris the Beard, Chris the Post, Del the Hat , Geoff, Grahame, John D, Keify, Mike H, Pete, Phil the Horse , Richard, Robin B, Robin H , Rowan, Simon, Terry, Colin the Crier. We Like This Place Awards – We have presented only 5 in 24 years recognising a wonderful atmosphere, excellent beer (and sometimes food), friendly customers and welcoming Landlords, Landladies and Staff. The prestigious honour has been bestowed to: The Six Bells at Woodchurch, The Bell Inn at Ivychurch, The George Inn at Bethersden, The British Lion at Folkestone and The Shepherd and Crook at Burmarsh. 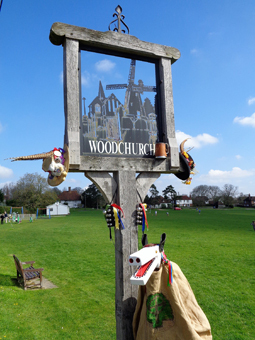 ABOUT US: A Cotswold Morris Dancing side from the village of Woodchurch in Kent. Formed by a group of villagers, the side had their first practice meeting in April 1990 and in 2015 we celebrated our 25th Anniversary! To celebrate our Silver Jubilee we had a very special programme of stands and events throughout 2015. This included a trip to France, The National Morris Weekend, tour of Central London and the wonderful Biddenden Tractor Festival, New Romney Country Fayre, Tenterden Folk Festival and the Darling Buds of May Classic Car Show. In 2017 we have more exciting stands as well as many old favourites. We are always looking out for experienced or beginner dancers, and our practices take place every Weds from Mid October between 7.30pm and approx 9.30pm. We have dancers at different stages of their learning so all our welcome. We are always on the look out for additional musicians and singers too. If you would like to sponsor us please get in touch.